Best selling item! Handsome pillars with curved supports create an understated elegance in any room. Available in Mahogany, White and Blackwash. The Vivid Flame Electric Firebox plugs into any standard outlet for convenient set up. The features include remote control, programmable thermostat, timer function, brightness settings and ultra bright Vivid Flame LED technology. The Devin Fireplace features a compact prole and a clean silhouette, making it ideal for smaller spaces. Available in Dark Espresso and White nishes. The VividFlame Electric Firebox features include remote control, programmable thermostat, timer function, brightness settings and ultra bright VividFlame LED technology. Sheridan Mobile Electric Fireplace in White The Pleasant Hearth Sheridan Infrared Mobile Fireplace is ideal for homes, condominiums, lofts, apartments, and seasonal rooms. This unit has a 5200 BTU Infrared heater that quickly heats up to 1000 sq. ft. without drying the air. Comes fully assembled, just install the optional casters and plug it in! 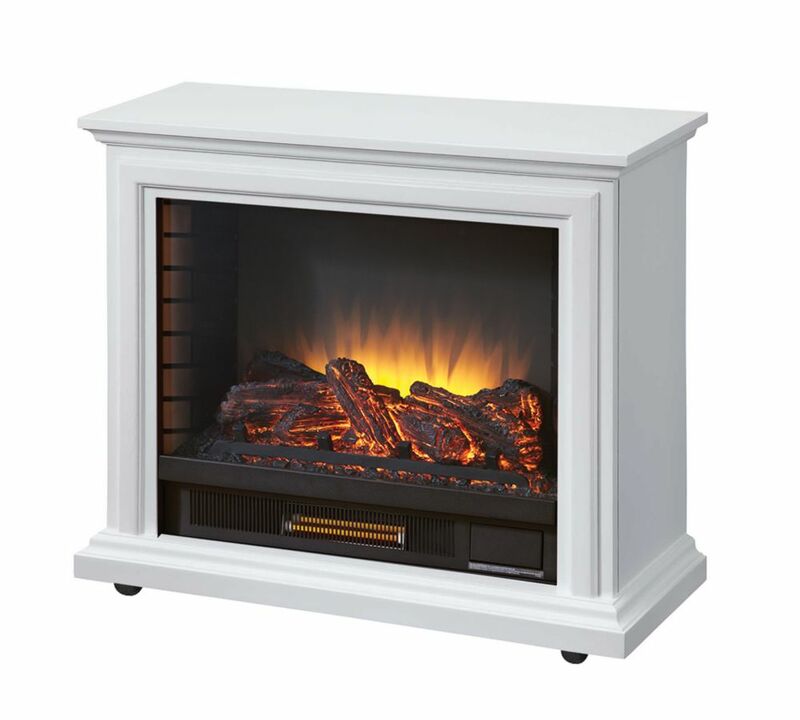 Sheridan Mobile Electric Fireplace in White is rated 4.1 out of 5 by 56. Rated 3 out of 5 by lavalinda from The fireplace arrived in perfect condition, was easy to assemble, and has been used it a few time... The fireplace arrived in perfect condition, was easy to assemble, and has been used it a few times over the winter. The flames are realistic, but it's less than exceptional at heating a space and the blower is a bit noisy, tho it becomes less noticeable with time. Nevertheless, it fits perfectly in my condo's false hearth and serves the need for some ambiance. Rated 1 out of 5 by Mable from I love my fire place...it’s perfect for the space ..... I love my fire place...it’s perfect for the space .. got here right on time .. Rated 5 out of 5 by Jean from Delivered on time and easy to set up. I... Delivered on time and easy to set up. I have not used it yet on a cold day. Rated 5 out of 5 by Donna from We love it, got it for our finished basement. It... We love it, got it for our finished basement. It heats the space, and looks great. Do you have to attach the casters,or can the fireplace sit on the floor?